This is for all the dads out there! There’s nothing more satisfying than completing a dream home or garden project, especially if it involves the whole family or a bonding session with dad and the kids. 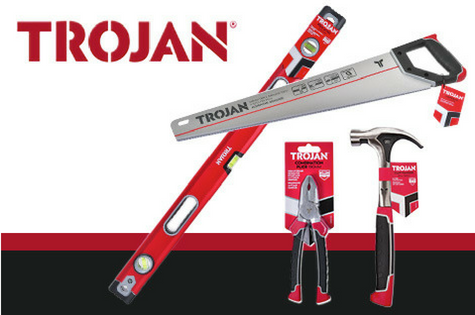 Trojan offer an extensive range of good quality tools for the DIY dad including, affordable tool sets that make the perfect gift. Whether he’s out building a deck or dreaming of renovating the garage into a man-cave, there’s no better time to pick up the tools than Father’s Day. No toolbox is complete without a Trojan Claw Hammer (starting at $12.98) featuring a comfortable and lightweight handle and claw design for easy nail extraction, or the versatile three in one staple gun set, ($23.98) that fastens three different types of staples and is ideal for any woodwork or craft projects. Other essential hand tools that are sure to please dad include Trojan’s chisel or file sets (starting from $34.98), ergonomic soft grip handsaws (from $13.98) and combination pliers (from $15.98) featuring induction-hardened cutting edges for a clean and accurate cut every time. For the gardening enthusiast Trojan has got you covered with their Powerstep Fibreglass rakes and spades (from $29.98) that feature strong and lightweight fibreglass handles enabling the user to maximise their full body weight when digging. The Powerstep digging and cultivating range make it easy for any weekend warrior to finish off those backyard or landscaping jobs. Trojan hand tools and garden ranges represent high quality design features and excellent value for money, and also offer a lifetime guarantee. Trojan tools are available exclusively through Bunnings Warehouse Stores nationwide and online. These tools are really valuable and everybody should use these tools in need. Online Essay Writing UK always available for help to students. The employer, Peninsula Pavers, include creativity, reliability, and dedication to the element – irrespective of the size of the mission. Len has the vision and insight of not only what works, however, what seems proper and is aesthetically alluring. He visionary and has the potential to make critical discipline modifications that shop each time and money. What kind of father is your dad? Ditch the Dull for Dad This Fathers Day…or Christmas! Could PowerAll be the perfect gift for Dad?